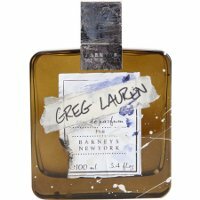 Greg Lauren will launch a new limited edition fragrance in collaboration with Barneys New York. The Greg Lauren fragrance follows last year's perfume for Barneys by L’Wren Scott. A completely unique fragrance designed and handcrafted by Greg Lauren himself in collaboration with Master Perfumer Ralf Schwieger. The combination of Tonka beans, vanilla and marine notes delivers irresistible sensual emotions, a very special fragrance both artistic and elegant. Greg Lauren Barneys New York is available now for pre-order at Barneys, $195 for 100 ml, concentration unknown. It is due for launch in November. Update: see a review of Greg Lauren Barneys New York. Vanilla and marine notes. Together? I know I’m cranky today but the thought of that combination turns my stomach. Yep, tonka, vanilla and marine notes…doesn’t sound good at all. Ralf Schwieger, though. Could be good, who knows. I am confused. Not only have I never heard of Greg Lauren, I am totally perplexed as to why a fragrance with his name would have any relationship to one by L’Wren Scott. Barneys seems to be doing a limited edition series with smaller designers, not sure there’s any other relationship. Vanille Marine? I don’t know that one. I think it’s Molinard. Could be Fragonard. Probably Molinard. There is a Vanille Marine by Molinard. Pretty good, actually. Simplistic to be sure, but oddly comforting. Sort of an aquatic tang that goes well with vanilla. And it’s cheap, which is good. It’s basically Motu with less seaweed and a sweeter base. Motu always reminded me of cola, strangely, and although I don’t think there are supposed to be any sweet notes, it still goes sweet on my skin. The L’Wren scent is awesome, not like anything else, cumin, imortelle, patch, and lord knows what else. This bottle is another take on the L’Wren bottle..